Osteochondroma, also referred to as osteocartilaginous exostosis or plainly exostosis, is the most common benign bone tumor. 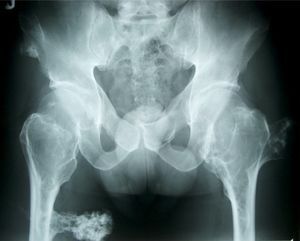 It can present as solitory osteochondroma or as multiple osteochondromatosis. Osteochondromas usually arise from the metaphysis of long bones, but can occur at other cortical bone metaphyses. The most common sites for these tumors are the distal femur, proximal humerus, and proximal tibia. They can also be in flat bones, such as the ilium and scapula, and rarely affect the spine. It is believed that these non-malignant tumors arise from unusual cartilaginous epiphyseal growth-plate tissue that spreads and grows by endochondral ossification. These tumors may present with a stalk-like structure and are known as pedunculated. Osteochondromas without a stalk are called sessile exostoses. Average age of clinical presentation is between 10 and 30. These tumors account for 10%-15% of all bone tumors, while representing 36% of all non-malignant bone tumors Solitary osteochondroma occur equally in males and females, while multiple osteochondroma affects males more than females, approximately 1,6:1. Malignant transformation from osteochondroma to osteosarcoma is possible in both solitary and multiple osteochondroma. This happens in approximately 1% of solitay osteochondroma cases and 5-25% in multiple osteochondromas. The etiology regarding the development of solitary osteochondroma is currently unknown. Multiple osteochondromatosis, on the other hand, does apear to have a genetic link. It is inherited in 70% of cases and has been associated with EXT 1 and EXT 2 genes. The association is currently not well understood and research is continuing to look into the link. Osteochondromas are usually asymptomatic and present most commonly as a painless bump near a joint, usually the knee or the shoulder. Other symptoms may present and are usually associated with the location of the osteochondroma. If the osteochondroma is located under a tendon, it may cause a snapping effect with activity as the tendon moves over the tumor. Additional symptoms may present if the osteochondroma is located near nerves and blood vessels. For example, a tumor on the posterior aspect of the knee may result in numbness and tingling, periodic changes in blood flow, loss of pulse, or colour change in the limb secondary to nerve and blood vessel compression. Options regarding medical management of osteochondroma is indicated only if symptoms are present and depends on a variety of factors including age, severity, disease extent, and overall health. Observation is the best way to manage a non-symptomatic osteochondroma. Medical treatment is usually not indicated for osteochondroma, since most times the condition is asymptomatic. Pain medication is only used if symptoms of pain present. Observation and regular monitoring is very important. Solitary ostechandromas generally do not require surgery and are usually monitored with regular X-rays. Surgery for solitary osteochondromas are only suggested when the exostosis has grown completely and a mature skeleton is observed on X-ray. The reason for this is to decrease the chance of reccurrence. Surgical removal is not indicated in multiple osteochondromas unless symptoms exist. It is very important to monitor multiple osteochondromas. If surgery is indicated, the tumor may be completely removed and a prosthesis may have to be used to replace any structural loss. Physiotherapy is indicated most commonly for post-operative osteochondroma cases. Functional mobility will be the primary focus with the treatment addressing range of motion, strength, restoring proper biomechanics. Osteochondroma presents as either solitary or multiple, and is the most common benign bone tumor. It commonly occurs in the proximal tibia, proximal humerus and proximal tibia, but can also occur in flat bones, and less commonly in the spine. Patients can be asymptomatic, where medical management mostly consist of regular monitoring of the condition with X-rays. Surgical excision can be considered in a mature skeleton, where after physiotherapy will play a role in the post-operative management. ↑ 1.0 1.1 1.2 Merck Manuals. Bone and joint tumors. Merck Manual Home Edition. Available from: http://www.merckmanuals.com/professional/sec04/ch044/ch044b.html (accessed 23/02/2011). ↑ 2.00 2.01 2.02 2.03 2.04 2.05 2.06 2.07 2.08 2.09 2.10 2.11 2.12 2.13 2.14 American Academy of Orthopaedic Surgeons. 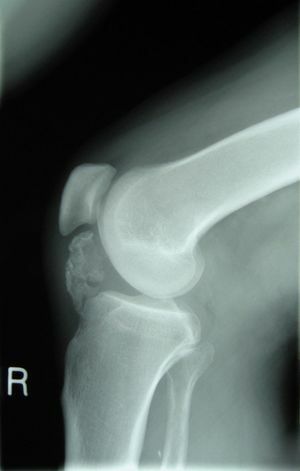 Osteochondroma (bone tumor). Available from:http://orthoinfo.aaos.org/topic.cfm?topic=A00079. 2007 (accessed 16/03/2011). ↑ 3.0 3.1 3.2 3.3 Murphey MD, Choi JJ, Kransdorf MJ, Flemming DJ, Gannon FH. Imaging of osteochondroma: variants and complications with radiologic-pathologic correlation. Radiographics 2000;20(5):1407-34. ↑ Samartzis D, Marco R. Osteochondroma of the sacrum: a case report and review of the literature. Spine 2006;31(13):425-429. ↑ 5.0 5.1 5.2 5.3 5.4 5.5 5.6 Goodman CC, Snyder TK. Differential Diagnosis for Physical Therapists: Screening for Referral. 4th edition. St. Louis, Missouri: Saunders Elsevier, 2007. ↑ 6.0 6.1 Hubbard T, Frey KM, Hosey RG, Milbrandt T. Tibial Osteochondroma in a High School Football Player. Athletic Therapy Today 2008;13(6):36-7. ↑ 7.0 7.1 7.2 7.3 7.4 7.5 7.6 Moon K, Lee J, Kim Y, Kwak H, Joo S, Kim I, Kim J, Kim S. Osteochondroma of the cervical spine extending multiple segments with cord compression. Pediatric Neurosurgery 2006;42:304-307. ↑ 8.0 8.1 Ratliff J, Voorhies R. Osteochondroma of the C5 lamina with cord compression: case report and review of the literature. Spine 2000; 25(10):1293-1295. ↑ 9.0 9.1 Roa A, Abraham G, Rajshekhar V. Osteochondroma of rib with neural foraminal extension and cord compression. Neurology India 2007;55(4):428-429. ↑ 10.0 10.1 10.2 10.3 10.4 10.5 Chin K, Kharrazi F, Miller B, Mankin H, Gebhardt M. Osteochondromas of the distal aspect of the tibia or fibula. Journal of Bone and Joint Surgery 2000;82:1269. ↑ 11.0 11.1 Yoshida T, Matsuda H, Horiuchi C, Taguchi T, Nagao J, Aota Y, Honda A, Tsukuda M. A case of osteochondroma of the atlas causing obstructive sleep apnea syndrome. Acta Oto-Laryngologica 2006;126:445-448. ↑ 12.0 12.1 12.2 Errani C, Jutte P, De Paolis M, Bacchini P, Mercuri M. Secondary synovial condromatosis in a bursa overlying an osteochondroma mimicking a peripheral chondrosarcoma-a case report. Acta Orthopaedica 2007;78(5):701-704. ↑ 13.0 13.1 Woertler K, Lindner N, Gosheger G, Brinkschmidt C, Heindel W. Osteochondroma: MR imaging of tumor-related complications. European Radiology 2000;10(5):832-840. ↑ 14.0 14.1 14.2 Robbins M, Kuo S, Epstein R. Non-traumatic fracture of an osteochondroma mimicking malignant degeneration in an adult with hereditary multiple exostoses. Radiology Case Reports 2008;3:99.